As the world is becoming connected, consumers are expecting their favorite brands to do more than deliver the best product. Consumers want to have a direct connection with their brands, and a direct engagement. Brand owners want to be able to communicate and engage with their audience based on the physical product they are selling. Being able to create a dialogue between the consumer and the product is just amazing. Packaging represents a huge opportunity for brands to tap into. With the right application and insights it can be turned into a powerful media channel that communicates and appeals to a diverse audience, enhances your brand message and leverages whatever is relevant in that moment. Gen-Z and Gen-X (Millennials), together by far the largest demographic, like to keep it simple. Millennials are defined to be tech-savvy, well-informed, mobile and anxious to discover and experience something before anyone else. Changing consumer behaviour will revolutionise packaging completely. Interactivity between the package and the consumer is the next avenue to build the romance between your brands and your customers. But you will have to have strong story content and a unified strategy to leverage it rather than chase it. The timing is ideal to merge new technologies with conventional Print, and to maximize your print investment. NFC remains the strongest player in the marketing and retail area because it’s cheap, flexible, doesn’t need an app and is all about PULL, so empowers the consumer. Brand owners will be able to use NFC to create a bridge and an infrastructure between the traditional physical world and what can be added as a new experience in the digital world. NFC is perfectly placed to become the technology that creates the ‘Internet of Things’ (IoT) but will not be alone in doing this for the foreseeable future. 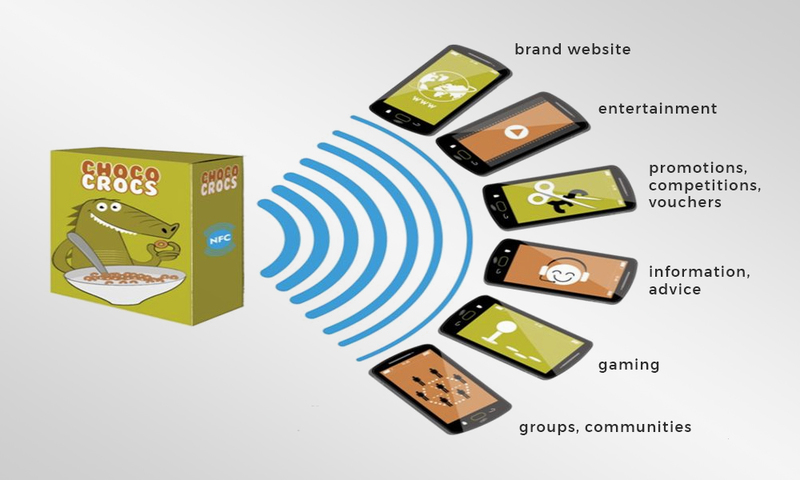 NFC technology can significantly enhance the value of packaging by connecting the brand owner and the consumer to the “Internet of Everything”. The involves the integration of electronic intelligence into everyday items, enabling them to become interactive in a way that improves the consumer experience, as well as the ability of brands and retailers to interact directly with consumers. NFC chips and tags can also be used as a means of advertising or exchanging information on notice boards, packaging, and the like. With this in mind, it is not surprising to see that, according to Semico Research report, the NFC market is to ship 23 billion units in 2020. NFC provides Brand marketers with customized fit-for-print programs designed to turn customers into “brand enthusiasts’’. The Purpose is TO TAKE YOUR BRAND TO THE HEART OF YOUR CUSTOMERS.